Volvo is celebrating 50 years international sales with its military sales program. Volvo’s journey from an unknown to internationally known brand began in Gothenburg, Sweden, after discovering Americans and other foreigners in the military and diplomatic services loved their cars. From 17 cars delivered the first year dabbling in the overseas markets, Volvo now exports thousands each year. The military sales program serve Germany, Japan and other areas under the name Volvo Car International Customer Sales. It caters to diplomats, military members and expatriates. 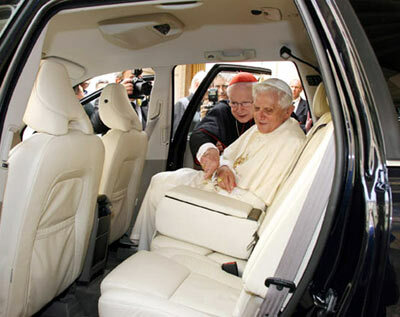 Pope Benedict XVI has joined the ranks of Volvo owners. The Pope was presented a sports utility vehicle in late June following a Papal Audience at the Vatican. 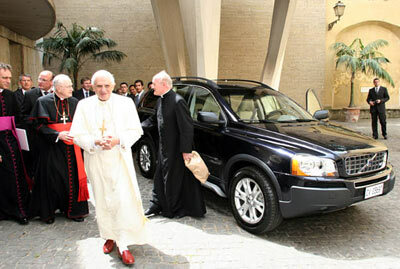 The Volvo XC90 delivered to the Pope, and fitted for his personal use, is a dark blue V-8 with a light interior. Volvo has been a world leader in establishing high SUV standards for safety in all driving conditions, and on any surface. It’s all-wheel driver system allows the car excellent off-road behavior, while its ROPS system helps Volvo avoid roll-overs.